Paul Z. Simons, writing under the pen name, El Errante, is the author of a series of recent dispatches from the liberated territories of Rojava in Northern Syria. Currently on a tour across the Bay Area, Simons has just returned from a region besieged by war yet is also in the midst of one of the most far reaching social experiments of the 21st Century: the 'Rojava Revolution.' The liberated territories of Rojava are a thriving example of stateless democracy and of a people who are overturning traditional institutions such as patriarchy and social hierarchies. Simons talks about his experiences including crossing international boundaries under false pretenses, attending commune meetings in Kobane, high-velocity detours around ISIS sympathetic villages, and the camaraderie of the YPG militias. Simons had full access to the various revolutionary organizations and militias and will discuss their mandates and implementation issues associated with realizing a stateless society. 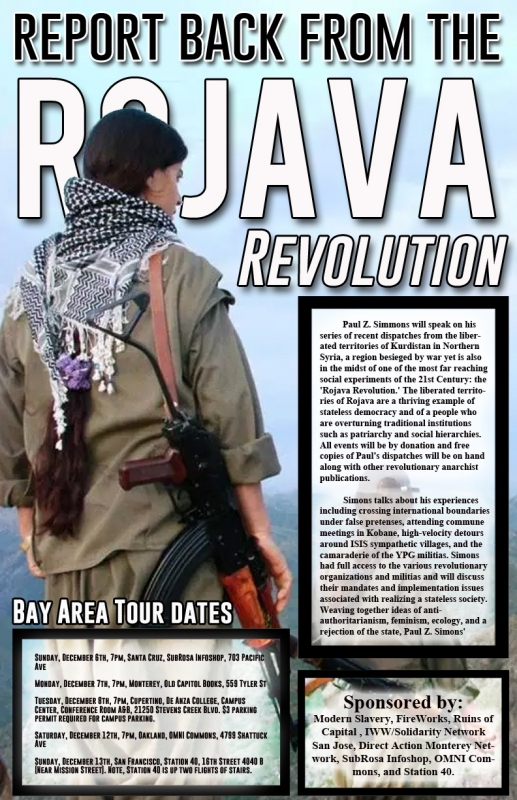 Weaving together ideas of anti-authoritarianism, feminism, ecology, and a rejection of the state, Paul Z. Simons' report, which is part adventure and part political journalism on the the Rojava Revolution is not to be missed by anyone working for sweeping social transformation in the current age.